- Digraphs, trigraphs and blends. 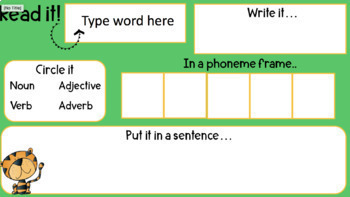 - Sight words (Fry 150-200 and an editable slide * 200-250 coming soon). - Punctuation flash card slides. - 'Pick your punctuation': Using full stops, question marks and adjectives. - Inference training: 'Reading between the lines' and identifying setting, time and character traits. - Predicting: Mentor text suggestions with YouTube links, sentence starters & crystal ball graphic organiser. - Connecting: Mentor text suggestions with YouTube links & sentence starters. - Inferring: Mentor text suggestions with YouTube links & sentence starters. - Comparing: Mentor text suggestions with YouTube links (coming soon), sentence starters & Venn Diagram graphic organiser. - Visualising: Mentor text suggestions with YouTube links (coming soon), sentence starters, 'visualising' practise with photographs. - Questioning: Mentor text suggestions with YouTube links (coming soon) and sentence starters. - Summarising: Mentor text suggestions with YouTube links (coming soon), sentence starters & 'Somebody Wanted But So Then' graphic organiser. - Synthesising: Mentor text suggestions with YouTube links (coming soon) and sentence starters. - Determining importance: Mentor text suggestions with YouTube links (coming soon) and sentence starters. Do you teach a split Year 1/2 class? I suggest purchasing the Year Two pack as it provides revision on Year One concepts. Note: There may be duplicate slides that feature in other year level PowerPoints. This is to cater for differentiation. 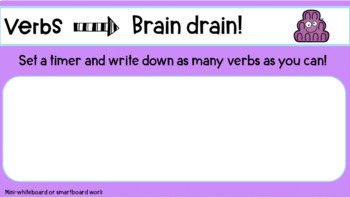 - Identifying nouns, verbs and adjectives in a sentence.